The event was held on Thursday 16 August at the Venue in Hemmingways Mall. “This occasion is taking place during the Women’s month whose origins emanate from the 1956 women’s march to the union building, which was led amongst others by Mama Albertina Sobukwe,” said Mtsi. “Mama Sobukwe’s passion for the liberation of the people of South Africa can be associated with the dire conditions which she experienced in her line of duty, I therefore urge all of you to remember and emulate her example as well as her teachings,” he said. Adding to that, BCM Executive Mayor Xola Pakati said the City wants to keep the memory of the struggle icon alive as well supporting the City’s health department in improving the public health system. The Mayor handed over certificates of appreciation to the nurses, who had been selected by the health institutions in the Metro. 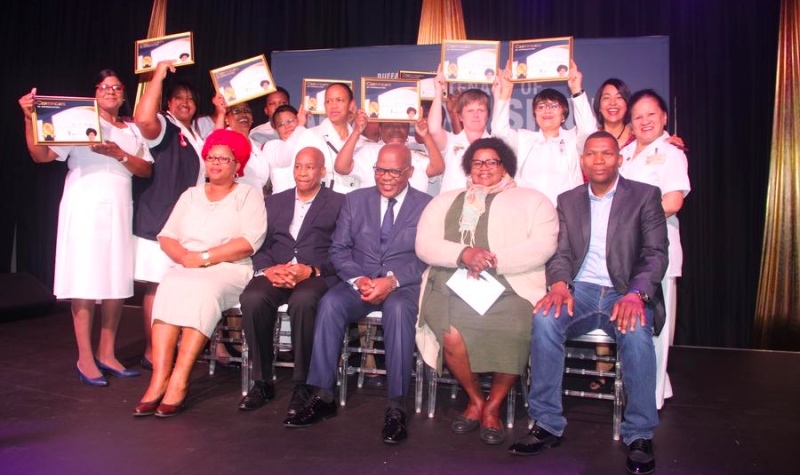 The 35 nurses honoured at the event were from Frere Hospital, Nkqubela Tuberculosis Hospital, Grey Hospital, and Bisho Hospital as well as the Cecillia Makiwane. One of those honoured was a 59 year-old Desiree Botha of Grey Hospital in King William’s Town who has been serving the state since 1976. “I began working at the Frere Hospital then I got a transfer in 1979 and worked at Grey Hospital over the years,” said Botha. She added that young nurses tend to come into the industry because they do not have other options and they come in for all the wrong reasons while back in the day nursing was their passion.